It's up, up and away with these colorful balloons! But it's not just a color by number page, it's also an addition worksheet. 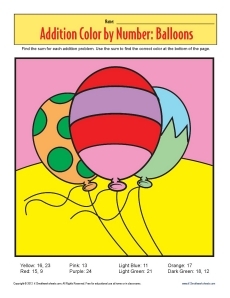 To determine the correct color, your youngster must find the answer to an addition problem. When he's finished, you'll be blown away!